Where do we even start with our love for leather? Whether it’s soft leather, full grain leather, patent, or suede, there’s never a time we don’t love leather, and especially not when we can buy it at amazing prices. If you have some leather to add to your wardrobe and don’t have an income that allows you the luxury of buying it from high-end brands, we’re here to help. Whether it’s footwear or bags, Paharganj is the place to head. The streets may be shady to walk around in for the finicky, but if you’re a little adventurous, this will treat your budget well. From trendy satchels and coloured backpacks to leather sandals and boots, there’s no dearth of leather goodies you can find here. Don't miss Bittoo Chappal Store (Shop No. 5048/B) and Vishal Foot Wear (Shop No. 5083) for awesome leather footwear; Sheetal Exports (Shop No. T37, Tooti Chowk) for bags; Ashu Fashions (Shop No. 1606) for leather boots, bags, and sometimes dresses. The nearest Metro Station is RK Ashram. Yes, we all know Sarojini Nagar has mountainous piles of clothes that can you sort you over for each season of the year for less than what it costs to go out for drinks, but leather is what we’re here to talk about. There are three particular shops in this market that sell some of the best leather footwear and bags you can find in a budget. We suggest keeping your eyes peeled to find these shops in the export lanes, as there’s no definite address for them. From ballets, tasselled loafers, ankle boots, and knee-high boots, to fold over clutches and totes, the variety you’ll find here will amaze you. PS: Look out for wear and tear on the products and ask for discounts. Surprise, surprise! 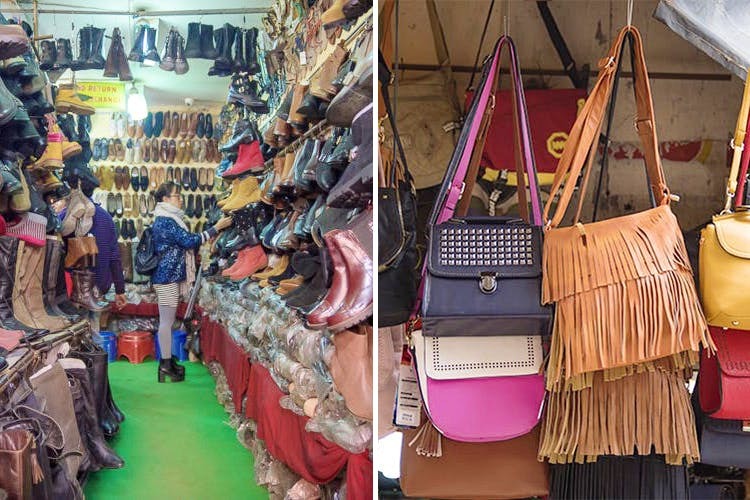 Karol Bagh has an entire market dedicated just to raw leather. Lined one after the other, the shops here house leather in great abundance—from buffalo and sheep leather to goatskin leather. If faux leather is what you need, you’ll find huge rolls of rexine in every colour and texture. There are plenty of bag and shoe suppliers sitting in the market too, so you can get your bag or shoe made exactly the way you want. The bonus of heading to Yashwant Place for your leather shopping? You get to eat possibly the best pork momo in the city. Head down to the underground shopping complex, where you’ll find shops selling leather jackets and boots of every style imaginable. Have something very specific in mind (like a powder blue motorcycle jacket)? You can easily get it made from scratch here. We suggest you pay extra attention to the kind of leather you’re picking out and the details on the product you’re thinking of buying—the zippers and buttons. This place is for the truly adventurous and curious—who else would wake up at 6am on a Sunday morning to head here to get their leather needs met? The thing to know about this place is that everything you get here is either damaged, second-hand, stolen, or surplus, so you’ll have to be extra careful when picking stuff out. You’ll find shoes from Woodland, Clarks, Steve Madden, Zara, and Trafaluq for an average of INR 400! You’ll have to sift through a lot of sizes, but if you’re lucky, you might just score a pair of brogues or Oxfords in your size for a throwaway price.